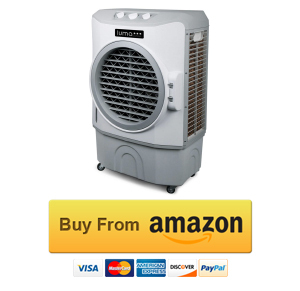 1 Best evaporative coolers reviews – our top picks! 2 How to buy the best air coolers? Using air conditioning at home isn’t always a good idea since these units guzzle electricity and hand you a big power bill at the end of the month. Smart homeowners know that the good old evaporative air coolers work just as good and they use only a fraction of the energy used by AC units. The only problem with buying air coolers is that you can go terribly wrong- sometimes the humidity is too much to handle, and on others, permanent installation creates problems. To ease off your burden, we are bringing the list of the top 10 best evaporative air coolers on the market today. If you are looking for a cooler, start your search here. 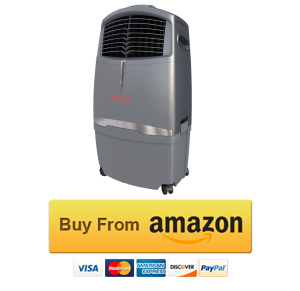 Best evaporative coolers reviews – our top picks! You can’t go wrong with a Honey C048PM cooler. This commercial portable cooler works both indoor and outdoor and uses ice to keep the temperature down in an area of about 600 sq. ft. The design of the cooler ensures that you don’t have to attend it every few minutes. Just plug it in, connect to a water supply, add ice and you are good to go. It also comes with overflow protection to catch the extra water when the ice melts. The 14-inch blades and three-speed fan can cool on three sides, making it a great choice for congested rooms. It doesn’t have a compressor, making it use less electricity than others. It comes with caster wheels for easy mobility. Customer service can be an issue. If you are looking for lower temperatures without creating extreme humidity in a room, you should get the Luma Comfort EC220W. This air cooler can easily cool an area of up to 650 sq. ft. without breaking a sweat and you can use it both indoors and outdoors. It comes with a 10.6-gallon water tank- so you don’t have to think about refills every few hours. If you prefer to run it for long periods, just connect it to a water line and enjoy a comfortable cool environment in hot and dry weather. It has a powerful fan with three-speed settings to get up to 1650 CFM airflow. It cools on three sides which helps in even cooling in a room. The Luma Comfort also has cooling pads which can filter airborne particles out and make stuffy areas feel fresher. The cooler doesn’t use a condenser, helping users save 80% energy. Can cool areas up to 650 sq. ft. If you want an air cooler that could handle indoor cooling perfectly for smaller areas, trust the Honeywell CL30XC. This portable air cooler doesn’t make unbearable or annoying noises like its larger counterparts and effectively cools areas up to 320 sq. ft. with 525 CFM air flow. 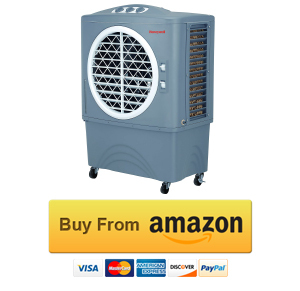 It doesn’t use a compressor, helping cool down your rooms more naturally. Just use water or ice in its 7.8-gallon water tank, and the four-speed fan will ensure that you get better overall cooling without having to refill it repeatedly. The cooler also comes with a low-water alarm, so you know when to fill its compartments with water. The cooler comes with remote control and caster wheels, adding extra comfort. The cooler comes with a 1-year manufacturer’s warranty as well. Great for indoor cooling for areas up to 320 sq. ft.
Isn’t good for large rooms or outdoor cooling. Small spaces have unique cooling needs- a large air cool not only grabs more area but also makes the room humid instead of comfortable. 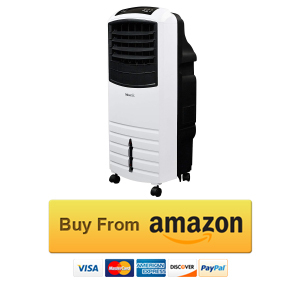 If you have been struggling to keep your small space comfortable, check out this NewAir AF-1000W air cooler. It can easily cool a room of 300 sq. ft. or less and comes with a 5.3-gallon water tank that you can fill with water and ice. It adds enough moisture to keep the room comfortable but doesn’t make it overly humid. The small and portable cooler comes with a sleek and trendy design with caster wheels and doesn’t take up much space. 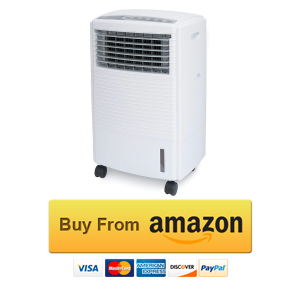 It comes with an oscillating function, complete with a three-speed fan to give you the best cooling. It even comes with a 10-hour timer so you can decide how long you want to keep the cooler running. The remote control makes usage extra comfortable. If you thought that smaller air coolers don’t come with a ton of interesting features, you should check out the Della 0480GM-48161. This small, sleek and popular evaporative air cooler comes with an ionizer to give you a feature-rich option for cooling small rooms. The unit doesn’t require permanent installation and comes with caster wheels for easy portability. 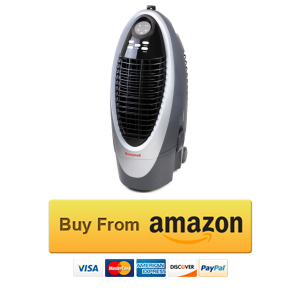 Use it as a fan, an ionizer, and humidifier or as an air cooler- you get all these options with a fantastic oscillating operation and an LCD display. The cooler can be operated with remote control. 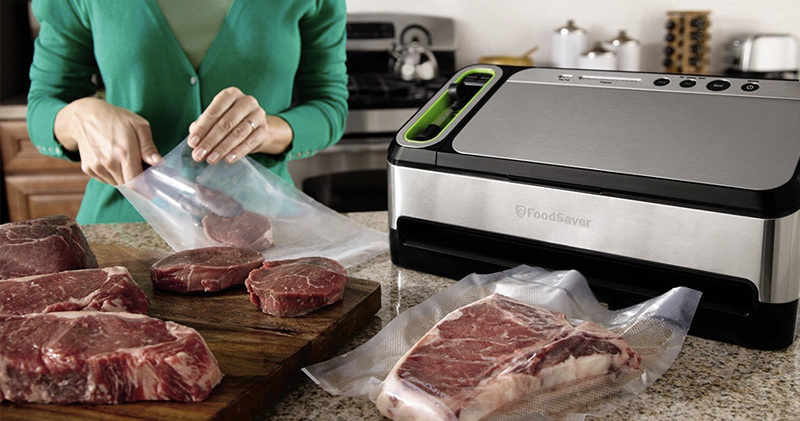 Like bigger coolers, it comes with three speed settings and a 1 to 12-hour timer feature. It works without a compressor, providing you extra energy savings too. If you have a home office, a small to mid-sized office or any other space measuring up to 850 square feet that needs adequate cooling in dry weather, depending on the Honeywell C060PM evaporative air cooler. Designed for use in commercial establishments, the cooler works best for areas with low humidity. For a cooler its size, this Honeywell product uses relatively less energy, helping you save on power costs as well. It throws air in a 12-yard area and comes with adequate cross-ventilation features too. The product is UV protected and can be used outdoors as well. Good for larger areas up to 850 sq. ft.
Honeywell’s products are known for being high in quality as well as customer satisfaction. 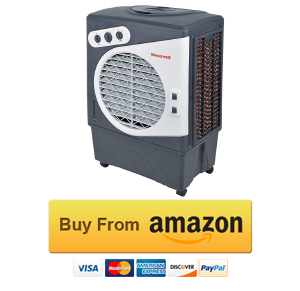 If you want to buy something from this brand but are worried about the price, check out the Honeywell CS10XE evaporative air cooler. If the humidity levels in your home go below 60%, you should check to use this cooler to make it cooler and more comfortable. The natural process of evaporative cooling lets is better than an air conditioner, which uses compressors. It is also a cheaper option. 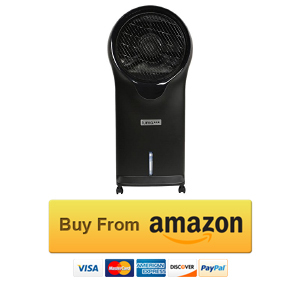 You can use this unit as a fan or as a humidifier which generates a more natural breeze. Use it around your house by making use of the caster wheels. The noise level is also relatively lower. The cooler even has a detachable water tank for easy cleaning and a low water alarm. Smaller air coolers are becoming very popular these days, and one of the most sought-after options in this category is the Luma Comfort EC111B. It helps you in giving a stylish air-cooling option while lowering your electrical bills. The compact unit can be used for rooms measuring up to 250 sq. ft. which it cools with the help of its 500 cubic feet per minute cool air throw. You can use both ice and water with this air cooler. You can program the time for 30 minutes to 7.5 hours for unattended operation. It provides 3 fan speed settings. Not only this, it works as an air purifier as well. 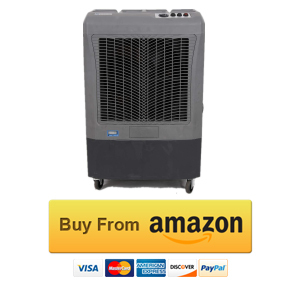 If you are looking for a powerful evaporative cooler that can make areas as large as 750 sq. ft. comfortable to use, buy the Hessaire MC37A. 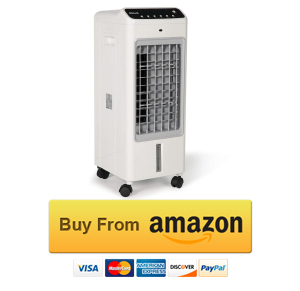 It is designed to give you heavy-duty air cooling in larger areas, whether indoor or outdoor. It doesn’t use any chemicals coolants or compressors, making it safe to use. Save energy and money- just add water and ice and plug this device to make your room more comfortable. It generates 2,200 cubic feet per minute of cooling power. It has a seven-foot-long cord so the cooler can be placed at the right spot in a large room for more efficient cooling. It also comes with built-in overheating protection that shuts down the unit if it runs out of water. Powerful cooler for areas up to 750 sq. ft. If you are looking for a simple and easy to use air cooler, the SPT SF-612R should be your first choice. This compact and elegantly designed cooler can be used in smaller spaces- up to 250 sq. ft. Its unique cooling pad design helps it blend into any décor and room- even in a kitchen or a garage. The lightweight unit weighs only 17 pounds an comes with wheels which you can use to transport it anywhere in the house. With a 10-link water tank, the cooler can produce 476 cubic feet per minute of air flow which is quite powerful for its size. It has three-speed settings along with a natural mode, a sleep mode and a timer which runs anywhere between 30 minutes to 7.5 hours. The LED control panel is also a handy feature. How to buy the best air coolers? Air coolers are the perfect alternatives to air conditions as they are less expensive, use less energy and provide a more natural cooling experience. People who do not prefer to use chemical coolants also prefer evaporative coolers instead of air conditions. However, selecting the right cooler could be tricky. First, check the size of the cooler you should buy. Buying small coolers for large rooms won’t do anything good for you. These smaller coolers generally don’t pack enough power to cool an entire room and focusing just on one person or corner wouldn’t be fruitful either. Larger coolers in smaller rooms are also disastrous since then add too much humidity to the room. Once you have decided the size- check out the features you like to have. Some people prefer portable systems while some others like permanent installations. Some don’t mind turning knobs on the coolers while others prefer using remote controls. The number of features is just “add-on” for extra comfort. So, obsessing with features doesn’t usually help. Lastly, check the price of the cooler and decide if it is the right fit for your pocket. We advise you to look for ‘value for money’ instead of a cheap alternative. When it comes to air coolers, it would be worthwhile to look for the best products in the market. After all, who wants to sit in a hot and dry room with a low-quality air cooler that goes off without warning? Spending money on quality products will help you get more durability and reliability. Don’t wait for the peak of summer to get yourself an air-cooling unit. Start exploring your options today. 10 Best Evaporative Coolers of 2019 Reviewed by TechLogitic. Let’s take a look at the 10 best evaporative coolers of 2019.